Hey there High Diver’s! 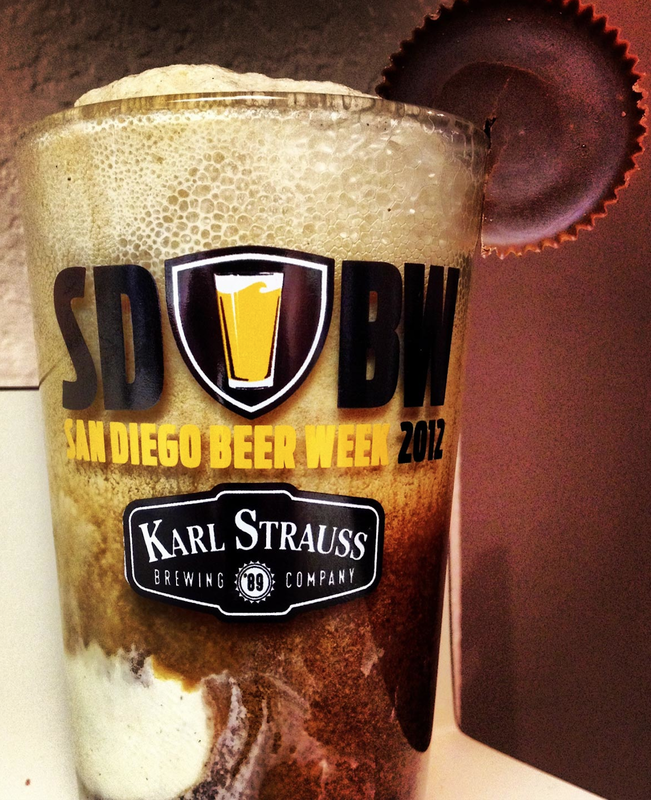 So we’re totally stoked for San Diego Beer Week starting this Friday, November 1st. We are kicking the celebration off with our locals only tap take over. We’re featuring some of our favorite local breweries including Ballast Point, Stone, Monkey Paw, Societe, Green Flash, Alesmith, Coronado, Iron Fire, Acoustic Ales, Port Brewing, Lost Abbey, Rough Draft, and last but certainly not least, Karl Strauss. I’m really stoked about some of the califragilistic beers we’re gonna have on tap. One of the beers I am soooo stoked on is Karl Strauss’s Peanut Butter Porter. This beer is something special if you’re a peanut butter chocolate lover like me. It has a light body coming in at 5.6% abv. with a good peanut butter chocolate finish that makes you want another. If you’re gonna stop by and have a glass, it goes awesomely with our fudge brownie dessert which is a chocolate lover’s heaven! I am also really excited about having Framoise De Amorosa on tap again – a delicious American wild ale weighing in at 7% abv. When you take the first sip, you taste that raspberry flavor the finishes with a delicious mild sour finish that is to die for. This beer pairs perfectly with our Spring Chicken Salad mixed with a raspberry vinaigrette dressing. One final beer I want to recommend you don’t miss is Iron Fire’s Devil Within IIPA, and this bad boy is bringing out your inner devil with a 9.5% abv. A nice hoppy beer, but not to hoppy with a citrus aftertaste that you IPA drinkers will love, and you know how us San Diegans love IPA’s. This beer pairs amazingly with our Duke Burger. Those are not the only beers that deserve mention, here is the rest of the list – I just didn’t wanna go on for ever about all the great beers we will have on tap! I hope to see you there and as always, I’ll be the guy acting like I am working. All right ladies, once again that special day where we honor ya’ll is coming up quick. This month we are doing our Chicks For Beer beer and food pairing early so we can celebrate San Diego Beer Week. This month our featured brewery is Port Brewing. This event is always a blast as many of you ladies already know. Our head chef, Steve is breaking out a delicious line up as usual, and we’re gonna have some delicious beers on tap for this event. My favorite is the Mongo IIPA – this is one of the best IIPA’s that’s made in San Diego and that’s saying a lot. We will also be featuring Shark Attack Red, Board Meeting Brown, High Tide Fresh Hopped IPA, and Older Viscosity – an aged version of Old Viscosity. So get your tickets fast ladies, because this event sells out quicker than drinking a pint of San Diego’s finest! 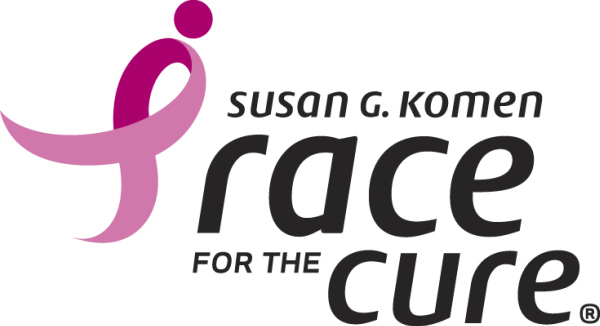 Remember this event is a charitable event, we donate money to the Susan G Komen Foundation every month and sadly, breast cancer has affected many of us. So I hope to see all you wonderful ladies here, I’ll be the guy looking a little stressed cause I wanna make sure ya’ll have an amazing experience! GET YOUR CHICKS FOR BEER TICKETS HERE! We are getting pumped for our Ballast Point Tap Take Over. As usual, we have a friggin’ califragilistic beer line up that you just can’t miss. 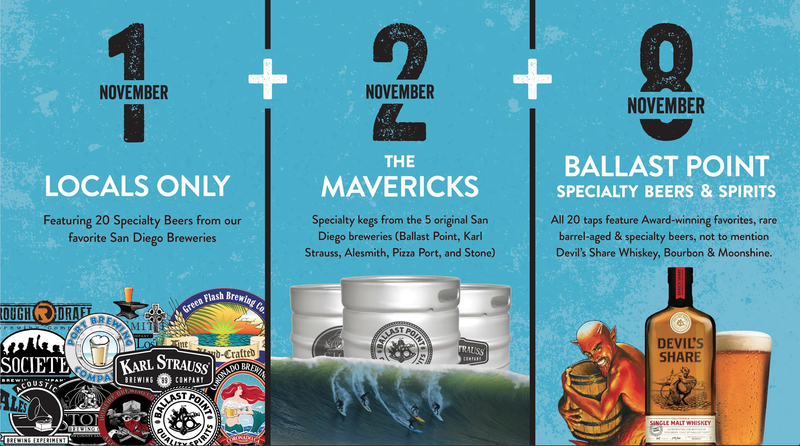 We are featuring 20 Ballast Point Beers that are gonna make your head spin. Another beer to get ready for is Whisky Barrel Aged Victory At Sea Imperial Porter. I had this beer last year and I gotta tell ya’ll it was a master piece. Porters are not really one of my favorite styles, but I freaked out when I tried this one. With that nice dark imperial porter taste combined with the vanilla undertone brought about by aging it in the whisky barrels I was stunned. 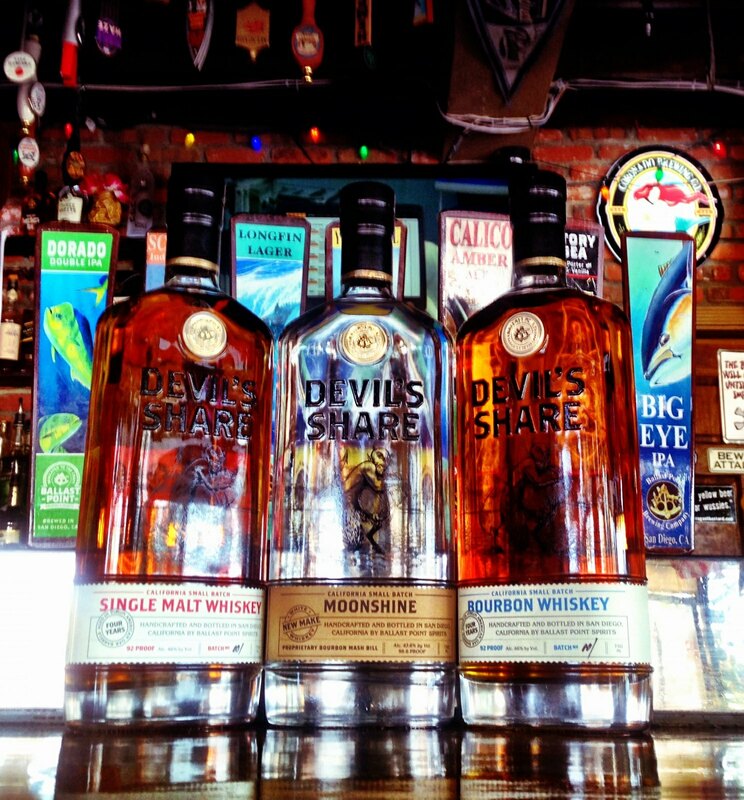 You don’t wanna miss this one and while you drink it, it pairs beautifully with our Cheese Cake. Another Beer your gonna love is Sculpin IPA on Nitro. Sculpin is already one of my favorite IPA’s but to put it on nitro… “forget about it!” It’s to die for with that creamy taste that nitro gives a beer so you better get a glass before I drink it all. Like any IPA, this beer pairs wonderfully with our burgers but I’d say it goes best with our Gorgonzola Bacon Cheese Burger. While I am mentioning Sculpin, we will have Sculpin Habenero as well which is the perfect beer to drink with our famous Kraken Burger. The last beer I wanna hype up is Barrel Aged Black Marlin Tart Cherry on Nitro. This is another beer that is so limited that I have not had the honor of tasting but I am told it is friggin’ amazing. Check out our full list of what we will have available and I hope to see you there! I will be the guy looking like he is in heaven! 1 in 8 women will be diagnosed with breast cancer in their lifetime…how many women do you know??? As October is breast cancer awareness month, here are a few ways that you can help the cause with the High Dive Team!!! Get a buzz and help the cause! Stop by the High Dive and enjoy a “Sweet Pink Whiskey Shot” with proceeds going to the Susan G. Komen foundation. Attend one of our Chicks for beer events – 100% of the proceeds go to S.G.K.! The money we raise will go to pay for women who can’t afford being tested, and for buying food & amenities for the families affected. This month down at The High Dive we will be featuring Bear Republic Brewing Co. In 2006, we opened our Factory Five Brewery in Cloverdale, just 15 miles North of of our original brewpub in Healdsburg. 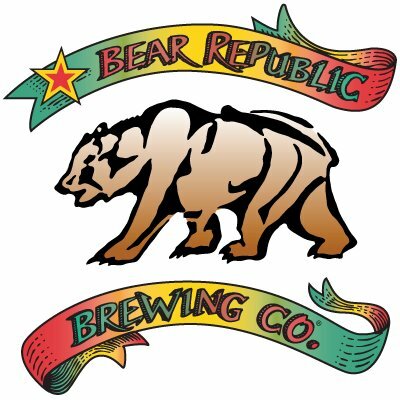 In 2014, Bear Republic was recognized by the Brewers Association as the 36th largest craft brewery in the United States. The daring and bold brews of Bear Republic have earned top honors in the American brewing industry. Racer 5 IPA® is one of the most award-winning beers in the USA. In 2006, Bear Republic won the Small Brewing Company and Brewmaster of the Year from the Great American Beer Festival®. Brewmaster Rich Norgrove likens this to winning the Daytona 500. To date, Bear Republic has won 19 medals from the Great American Beer Festival®. Additionally, we have won various medals from the World Beer Cup®, Good Food Awards™, The California State Fair, and many more. This month down at The High Dive we will be featuring Ironfire Brewing company. Every one of our ales and lagers has our own unique “brand.” Sometimes this leads to our beers not fitting into neat little cookie cutter categories. We don’t care about that anyway. Ironfire’s beers are for the folks who enjoy beer in all its forms regardless of classification, origin or preconceived notions. Hola High Divers, this week our featured brewery is one of San Diego’s favorites and premier Breweries, Stone Brewing. Stone was founded in 1996 in San Marcos California by Steve Wagner and Greg Koch. Since then they have moved their Brewery to their new beautiful location in Escondido California. Hello there High Divers. This week at The High Dive we our proud to have Avery Brewing as our featured brewery family owned and located in Boulder Colorado. “Since 1993 our brewery has been committed to producing eccentric ales and lagers that defy styles or categories. Our products are thoroughly American at heart: blending Old World tradition and expertise with ingenuity, creativity and boldness. Cheers High Divers see you soon! 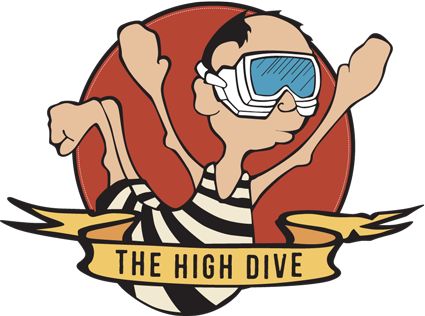 We are very proud to be featuring Ballast Point Brewery this week at The High Dive. Not only is it american craft beer week but on Saturday May 18th we will be celebrating the 3rd annual Ballast Point Day with a total tap take over YA HEARD San Diego!!! It all began with a home brewer’s humble dream. During his college years, young Jack White developed a taste for beer. After graduation, he decided it was time to explore more interesting beer than he could find in the store, or at a keg party, for that matter. So, he began home brewing in his back yard. He got good at it, and quickly realized it wasn’t that easy to get his hands on the various supplies and ingredients he wanted—nor did he have people to trade brewing ideas with. He needed a place to get great ingredients. So, one rare sunny day in San Diego in 1992, Jack opened Home Brew Mart: A home brewer’s nirvana filled with the supplies, ingredients, and conversation every home brewer needed to make better beer at home. Home Brew Mart thrived and soon Jack was joined by Yuseff—a fellow home brewer with a similar dream—and home brewing awards, to boot. Together, they moved the brewery from Jack’s yard to the back room of Home Brew Mart, and opened Ballast Point Brewing. In 1996, Ballast Point Brewing was born. Naming the beers was easy—Yuseff loves fishing, and he and Jack both love beer. So they brought the two together and started naming their beers after fish. After all, regular guys doing what they love—that’s what this was all about. Today, the beer labels still have fish on them as an homage to the brewery’s origins and as a reminder to always do what you love. As customers began tasting Jack and Yuseff’s back room brews, they wanted more. So they bought the beer. A lot of it. By 2004, Ballast Point had outgrown its back room location and was going to have to move to keep up with demand. Demand increased, so Ballast Point continued to grow! Home Brew Mart remained in its original location, serving home brewers and their beer dreams, alike. It turned out that Home Brew Mart was not only the perfect grounds for cultivating new beers, but also relationships with beer lovers who would eventually become employees, each one crucial to the brewing process and end product. Today, we are still real beer lovers making real good beer. Almost 15 years after its inception, Ballast Point Brewing’s dedicated team of craftsmen (and women) is still innovating, trying new methods and ingredients, and working constantly to increase capacity to try to meet demand. More than anything, they are staying true to Jack’s dream, and their own: Real beer lovers making real good beer. Our Featured Brewery this week is our friends down at Coronado Brewery, located locally in Coronado, San Diego California. Iron Fist Brewing Company is a family owned brewery located in Vista California located in the heart of the San Diego brewing community. “Our passion for the highest quality, hand made beers drove us to start making our own. Eventually, we decided to roll the dice and open up a brewery of our own. Every bottle and pint of Iron Fist beer must meet our unreasonably high standards before we consider sharing them with our customers. We specialize in Belgian style beer, but make a wide variety that appeal to a wide spectrum of flavors and preferences. All our beer is unfiltered and naturally carbonated. No fillers, no short cuts, no excuses”. Here at the High Dive We are excited to be featuring Iron Fist Brewery this week and hope you will join us and taste some delicious San Diego beer! Located in Ipswich, Massachusetts Clown Shoes started in 2009 recently celebrating their 3 year Anniversary. As a brewery that just started to distribute to San Diego, here at the High Dive we are excited to feature Clown Shoes Brewery for this weeks Pint Night Thursday April 4 . So prepare to get silly and clown around at The High Dive this Thursday with some Clown Shoe beer!